Apes in Space love breakfast. They also love eggs...They also love omelettes...what they don't love is making it themselves. Our target user is everyone who needs a breakfast. Overall, we are most proud of not just any feature, we are most proud of our ability to have planned out this project, and our ability to carry it out in execution. The Omelette Bot is the furtherance of technological advancement in our society. Technology has made our lives easier and by doing so has allowed us as a humanity to be busier. As such, this notion of technology has shifted focus into making our lives more efficient. Omelette Bot is here to make your busy life a little less busy and give you some extra time to sit back before you tackle everything you have in plan for yourself that day. But wait, let’s say you’re life isn’t that busy and you enjoy a leisurely life with friends visiting you often. Don’t worry, we’ve kept you in mind as well ;). Omelette Bot is tuned for party situations as you can cook 6 omelettes simultaneously and notifies you when someone’s omelettes ready. On another note, let’s situate the Omelette Bot in the work environment. Often times, I find myself leaving the house without having eaten breakfast. A feature we discussed Omelette Bot having was the ability to take orders through text or an iOS app synced to a specific Omelette Bot, and based on your GPS location, it would start the omelette so that by the time you’ve arrived at your office, your omelette would be fresh, hot and ready, for your enjoyment. There are many other use cases for Omelette Bot, such as an Omelette Bot vending machine, restaurant chains utilizing the Omelette Bot to reduce overhead costs, and many more. Omelette Bot is revolutionary in the way it prepares meals. It has been engineered with the user in mind. By providing a beautifully handcrafted user interface, the user can order an omelette with a variety of toppings, of their choice. The user will also be prompted to enter their name and optionally their cell phone number. In the event that a number is provided, Omelette Bot will text the user 20 seconds before their omelette is complete. On the mechanical technical side of Omelette Bot, we take a variety of core engineering concepts in order to provide the interface that it does with the user. As a result of fluid dynamics, the eggs need to be placed at an optimal height to reduce spillage at the output of the egg dispenser while reducing back flow into the basin making it difficult to predict where the egg is currently situated in our egg transport mechanism. The topping dispenser has been carefully designed with a multilayer chamber in order to ensure that toppings could be distributed to the omelettes in an organized fashion without dispensing too much or too little. While these mechanical components were designed to have these qualities and characteristics, it was important to also design the manufacturing process in which each component would be built. From the electrical perspective, Omelette Bot is driven by an Intel Edison control a variety of IO devices. There are relays which drive the topping dispensers, the egg pumps, and egg beater (which we had ended up removing from our design in the latter half of the hackathon). The Edison is also connected to an L293 Motor driver which provides control to the head that ultimately actuates over the span of the underlying grill, and an area for the head to rest without affecting the omelettes. The Edison is also connected to a variety of sensors which allow the microprocessor to have more information pertinent to its’ current state, such as where it is currently situated in the linear actuator and whether eggs are currently being dispensed. From the embedded and software perspective, the Omelette Bot runs a server which can take requests from a front end developed as a Mac Application. This Mac app allows the user to request their omelettes and exactly what types of toppings they want on their omelette. The backend software is developed in Node.JS while the front end has been developed via Objective C. The backend also utilizes the Twilio API which provides us the ability to message our users when their omelettes are ready! The backend handles all the logical data requests coming from the electrical circuits. A queue manager has been implemented to keep track of all commands sent to the server, while more than one egg is being cooked simultaneously. Needless to say that multiple, completely unrelated components, yet completely connected in every way possible, needed to be coordinated and carefully thought out and planned. 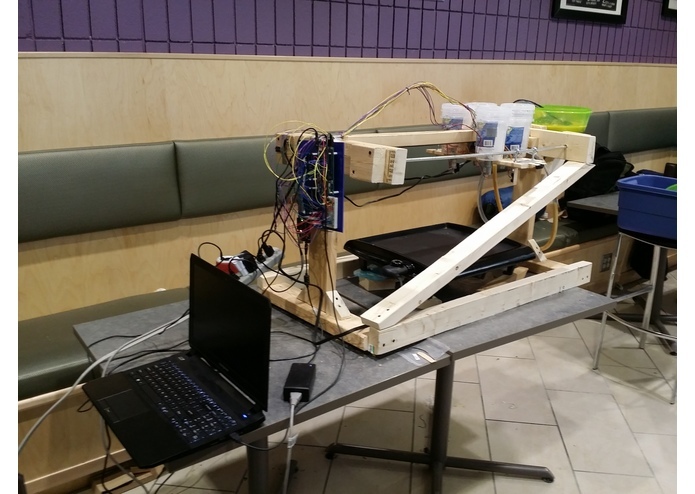 Like most projects at any hackathon, Omelette Bot in its current state is, at best, a proof of concept. To continue its progress, we would look into the improvement of the main components of the Omelette Bot. Namely, the electrical, mechanical, and software/embedded elements of the project. Specifically, a more reliable mechanisms of dispense, the mechanisms we used were a trade off for manufacturability and time to build. It would also be interesting to add more topping options on the Omelette Bot to provide more flexibility in the options provided for the omelettes, this means adding more topping dispensers. We would also look into adding more features to the omelette bot’s software user interface, something more robust and allows the user to spend more time within the application. As a result of the mechanical and software changes, there will need to be electrical modifications to accommodate for these improvements as well. Thank you for reading about Omelette Bot! We hope you had a great time checking out our project and we really hope to hear from you soon! Please feel free to contact us / Email us ! I worked on developing the Mac App that allowed users to choose where on the grill they wanted to cook their omelette and what toppings they preferred. Users were then able to confirm their order by including their name and mobile number so that they can receive text messages once their omelette was almost done. Wrote this app in Objective-C and integrated Twilio's API to be able to send text messages.